Fig. 3. Serum samples were collected every 10 min from each of three normal subjects during 24-h saline or GHRP-6 (1 pg/kg ■ h, iv) infusions. Samples were analyzed for GH by immunoradiometric assay. Adapted from Huhn et al. (34). occur if lactotrophs and/or somatomammotrophs in the pituitary expressed the secreta-gogue receptor. The mechanism of stimulation of ACTH is less clear. Although a direct stimulation of ACTH by the secretagogues is possible, there is no evidence that corticotrophs express the secretagogue receptor. Fig. 4. Healthy elderly subjects were treated with MK-0677 2 mg (n = 10), 10 mg (n = 12) or 25 mg (n = 10), or placebo (n = 10) daily at 10-11 pm. Subjects underwent serial sampling every 20 min for 24 h for GH at baseline and after 14 d of treatment (geometric mean ± geometric SE). 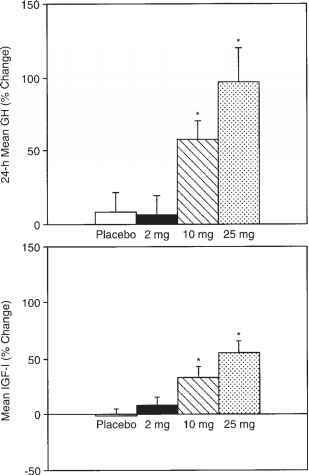 Serum IGF-I levels were obtained at baseline and post-treatment (geometric mean ± geometric SE). *, p < 0.05 from baseline. Adapted from Chapman et al. (37). Fig. 5. Twenty-four hour GH concentrations from a 69-yr-old man before and after 14 daily doses of MK-0677 10 mg. Blood was collected every 20 min from 8 am until 8 am. apparent inconsistency between the former two studies (34,48) and the latter one (37) may be related to the different GH assays employed. Chapman et al. employed a highly sensitive chemiluminescent GH assay with a lower limit of detection of0.002 ng/mL. 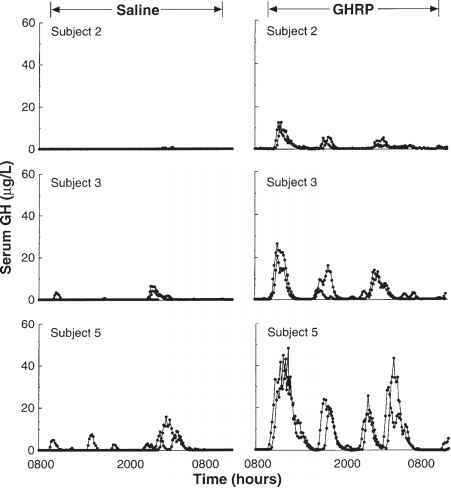 The apparent increase in GH peak number reported in the former two studies may be owing to the inability to detect very small peaks at baseline that subsequently have detectable magnitude after treatment. In addition, an increased interpeak nadir, which contributes to an increase in mean 24-h GH secretion, may not be appreciated in less sensitive assays. Based on infusion studies as well as on data from Chapman et al. using MK-0677, it appears that continuous exposure to a secretagogue results in upregulation of the endogenous GH pulsatile profile without perturbing the underlying pulse frequency generator.